Following the likes of Alisson, Roberto Firmino, Virgil van Dijk and Joe Gomez, Liverpool legends Patrik Berger and Vladimir Smicer take the ‘Bezzies’ quiz. Berger and Smicer were two of the Reds’ most prominent midfielders of the late 1990s and 2000s, with both part of the treble-winning season in 2000/01. The latter stayed with the club until 2005, playing a pivotal role in Istanbul as he scored the second goal in an incredible comeback in the Champions League final, lifting the trophy after his last game for the club. Now, the Czech duo regularly take part in Legends events for Liverpool, and will play in a special reunion clash with AC Milan at Anfield on March 23. To help promote the charity game, Berger and Smicer sat down to take the ‘Bezzies’ quiz and test their friendship from years together at club and international level. Smicer gave an interesting answer when asked which of John Arne Riise, Jamie Carragher and Jari Litmanen he would least like to be stuck in a lift with, while Berger’s pick for the worst fashion sense was less surprising. Berger was given a tough test when he was asked where Smicer stuck his penalty in the shootout in Istanbul, while in return the old No. 11 was tasked with picking his team-mate’s favourite goal for the club. 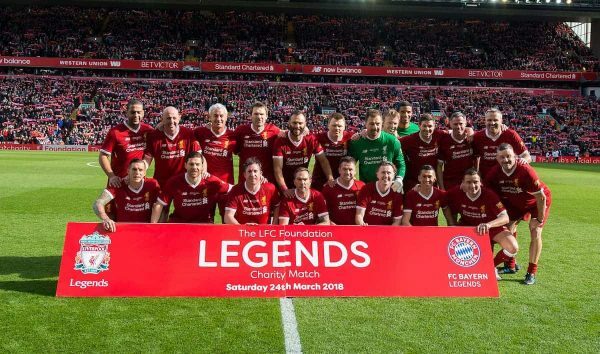 Carragher, Jerzy Dudek, Luis Garcia, Robbie Fowler, Steve McManaman, Daniel Agger, Ian Rush, Dirk Kuyt, Jason McAteer and Djibril Cisse are all confirmed to join Berger and Smicer as part of the next Legends squad. They take on a Milan side featuring Gennaro Gattuso, Kaka, Paolo Maldini, Andrea Pirlo, Massimo Ambrosini, Dida, Christian Abbiati, Alessandro Costacurta, Massimo Oddo and Serginho, among others.